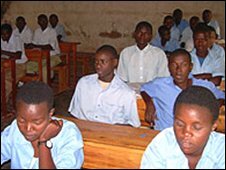 Rwanda’s parliament has decided that all education will be taught in English instead of French. Officially the Rwandan decision is a result of joining the English-speaking East African Community. But relations between Rwanda and France have been frosty following the 1994 genocide, when France was accused of supporting Hutu militias. Rwanda has applied to join the Commonwealth, the loose association of ex-British colonies and territories. France has consistently denied any responsibility for the genocide, in which some 800,000 Tutsis and moderate Hutus were slaughtered in 100 days. In 2006, a French judge implicated Rwandan President Paul Kagame in the downing in 1994 of then-President Juvenal Habyarimana’s plane – an event widely seen as triggering the killings. The decision taken by parliament on Thursday will apply from nursery schools to universities. Conversations in the capital, Kigali, are increasingly conducted in English. A colleague who recently visited the country reported being given a brisk brush-off for asking for information in French. And the Kigali Institute of Science and Technology has for some time used English as the official medium of instruction. English is the world linqua franca, so there is nothing bad with that. I totally love your website on south african embassy washington dc & will be back again.